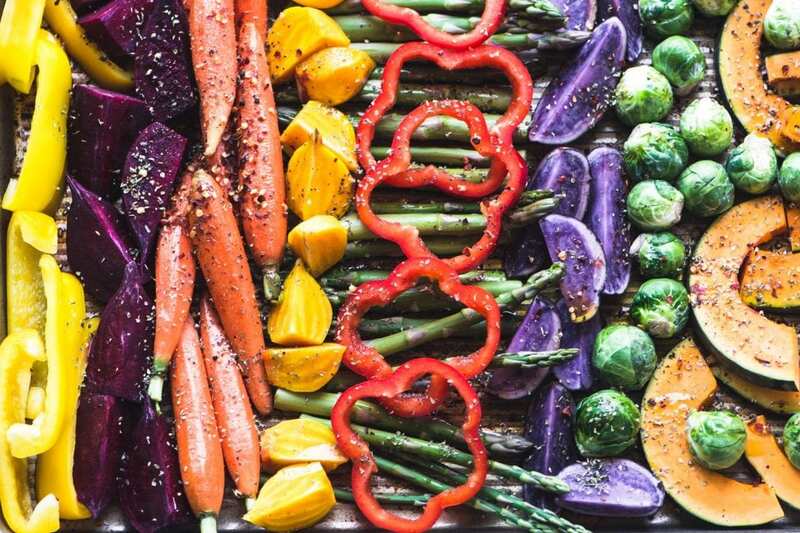 Easy Roasted Rainbow Vegetables ~ this super easy sheet pan side dish wakes up your dinner table with a pop of healthy delicious color ~ let’s banish those boring beige meals once and for all! 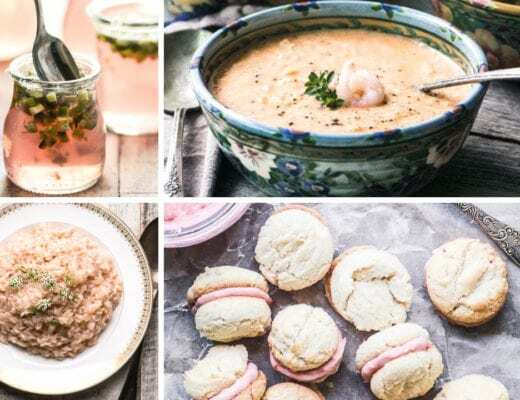 I might be in the minority here, but I’m all about the sides when it comes to holiday meals. I’ll dutifully fill my plate with a little bit of everything, just like my mom taught me, but when it’s time to dig in, I go straight for the sides. And to be honest, unless I’m head chef, I’m usually a little disappointed in the offerings. But there are so many beautiful colorful vegetables in the produce aisle right now, there’s no excuse for bland side dishes. Don’t get me wrong, I love meat. In fact I just signed on as an ambassador for the Certified Angus Beef® brand, so I’ll be bringing you lots of it in the coming year (I’m so excited!) But I’m an equal opportunity eater, and I love my veggies, too. I think they deserve the same respect and care you’d give a fabulous prime roast. 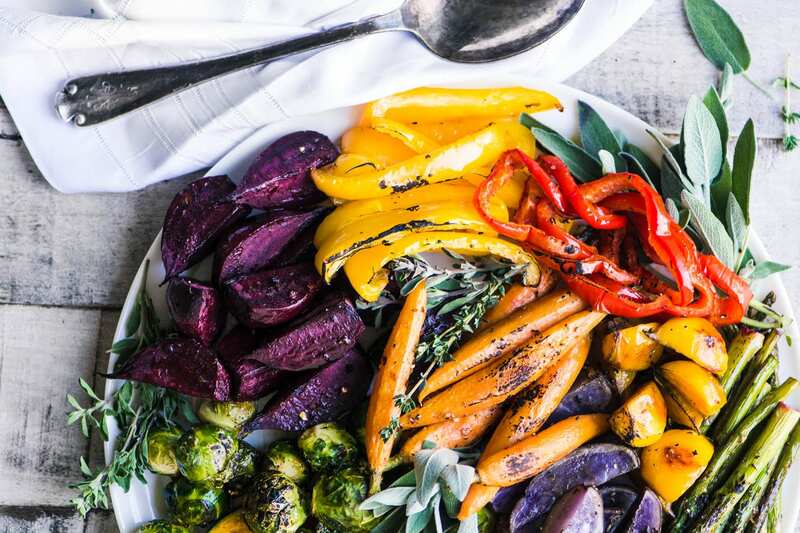 Roasted vegetables are such a boon for busy cooks, whether you’re making a regular meal or a holiday feast, because a hot oven does most of the work. 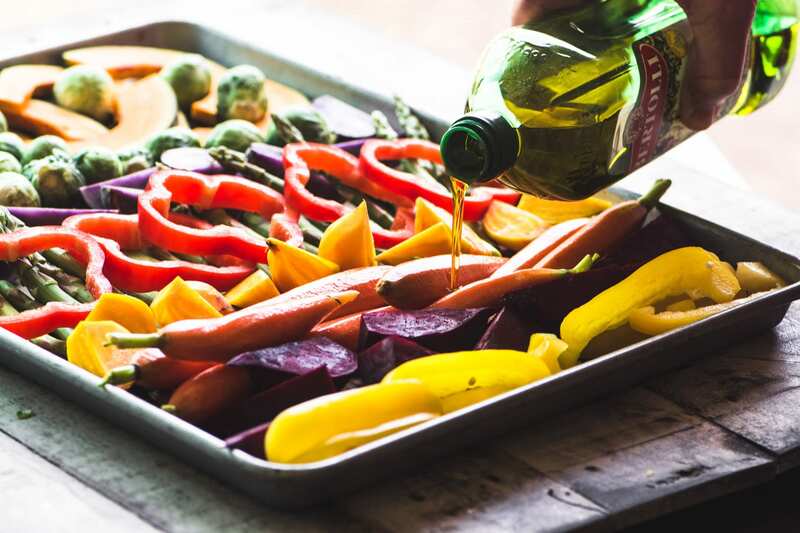 Roasting brings out the natural sweetness in the veggies, and all you need to add is some good olive oil, salt, pepper, and a sprinkle of whatever herb or spice you’re in the mood for. Today I’m using red pepper flakes and dried oregano for a Mediterranean flair. 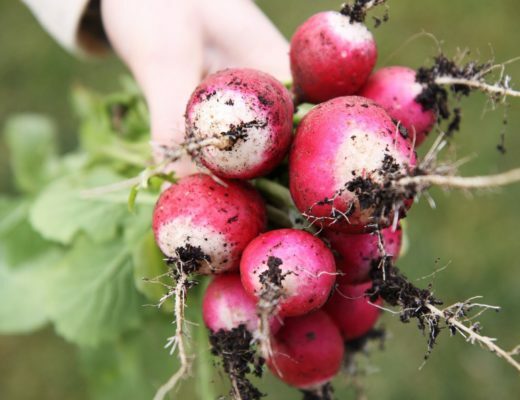 TIP: Aside from choosing pleasing colors, try to cut your veggies in different shapes for variety. Just be sure to keep them all relatively similar in mass so they’ll cook more or less evenly. 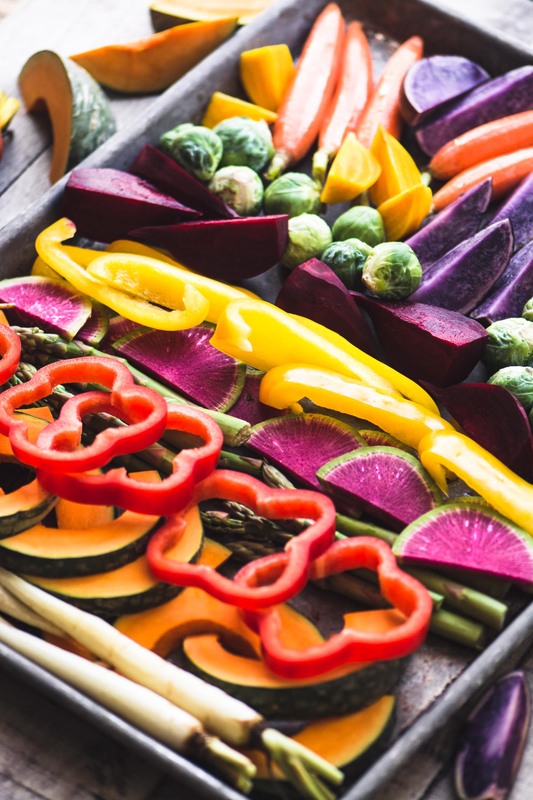 Ok, enough teasing, I know what’s on your mind…sure these rainbow veggies look gorgeous BEFORE they go into the hot oven, but what do they look like when they come out? They come out with vibrant color, in some cases intensified by the cooking, and perfectly caramelized in spots. All that’s left is to transfer them to your largest platter (maybe the turkey can give it up for one year?) tuck in a few sprigs of fresh herbs, and serve. They’re already seasoned! TIP: You can roast these up to several hours ahead, and then warm, loosely covered with foil, in the oven before serving. As a general rule of thumb, 2 standard baking sheets filled with a single layer of veggies will feed about 8. 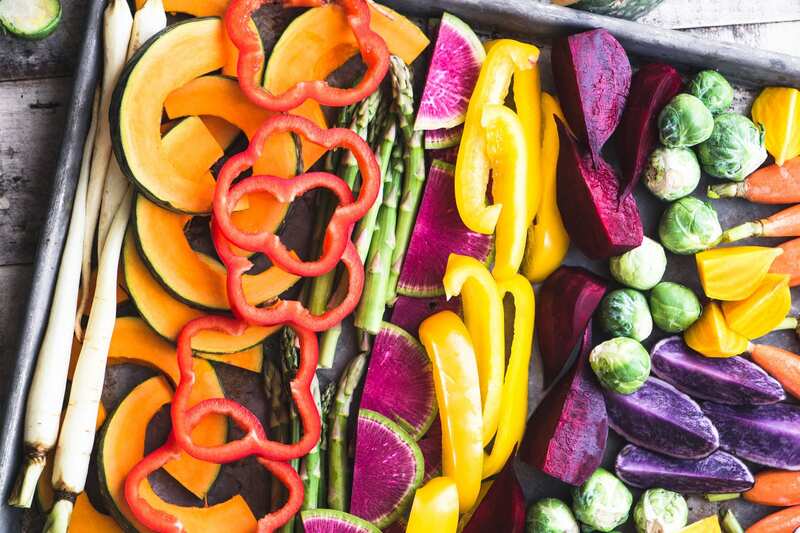 You don’t need the entire rainbow to make a colorful statement with roasted vegetables. 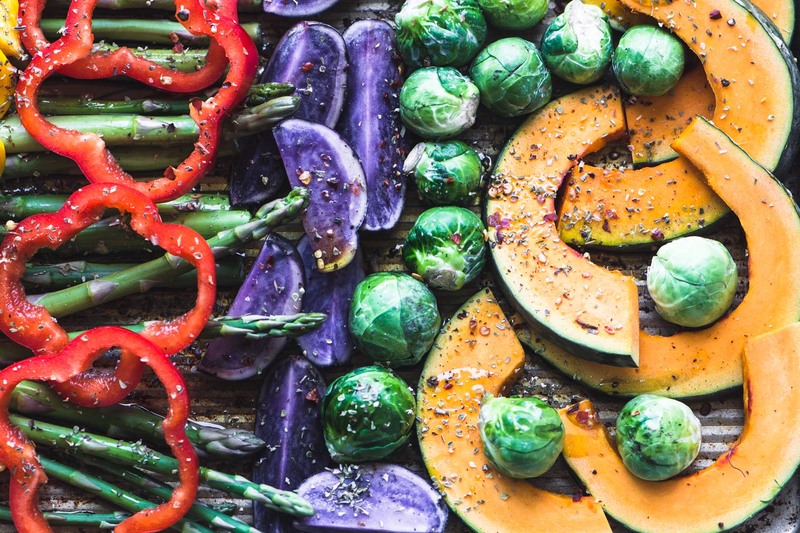 Try combining 2 or 3 for a nice effect, like blue potatoes and Brussels sprouts or green beans and red peppers. You can cut everything into bite sized pieces and mix them together if you like. The cooking time will be shorter. Love this. I am planning my Thanksgiving menu and making my grocery list today. This is the choice for my veggie. I hope mine turns out this beautiful. Thanks so much Sue. Sue, that is stunning! 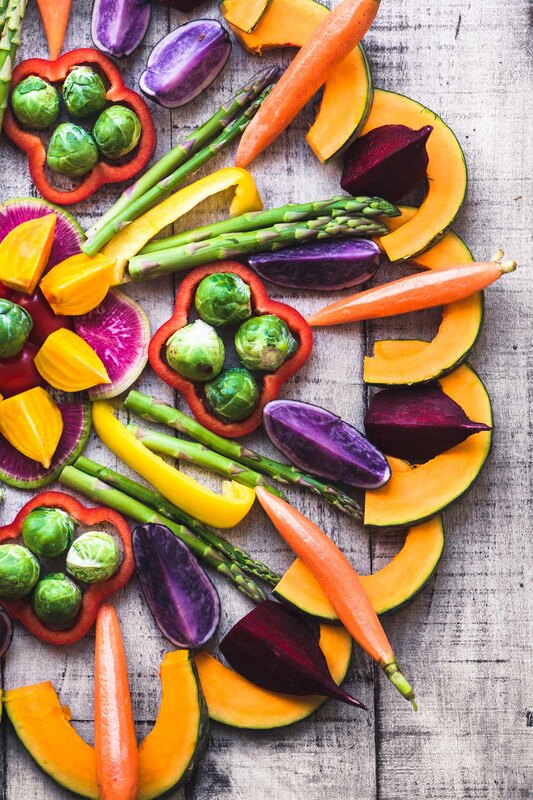 Growing up with a nutrition-conscious mother who was a world-class cook with great presentation skills, our turkey dinners always included lots of colorful vegetables. This looks like something she would have loved! If you are what you eat, I want to be a rainbow. B e a u t i f u l ! 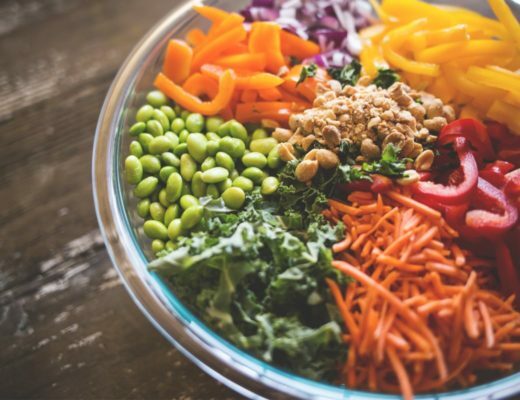 I have been on the hunt for colorful healthy dishes. It makes me happier than looking at those all green salads. Plus, it is super easy to make. Yey! 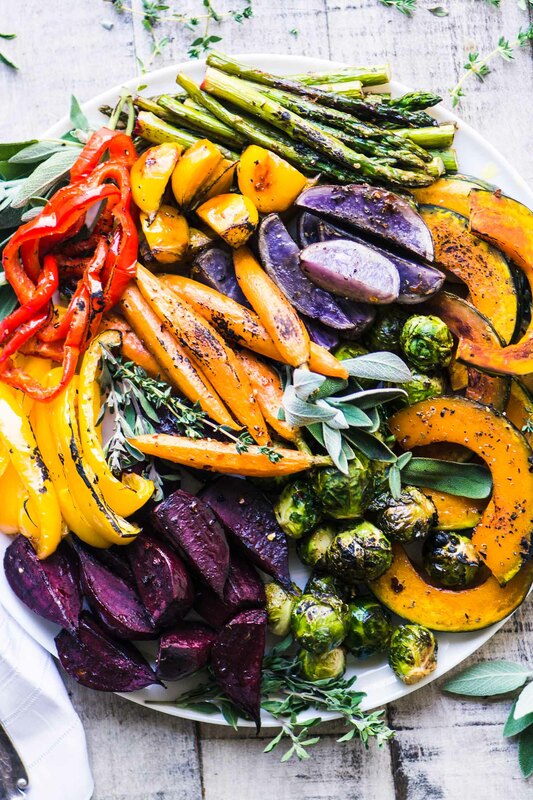 You’re right, the roasted veggies are a little more appetizing in the colder months than a green salad ~ enjoy! These veggies are GORGEOUS!! Love those colors! Thanks Chelsea, I love winter veggies, they don’t get enough credit! Glad to find healthy “support” for the turkey :-) Thank you for beautiful photos as well ! Amazing colours! Bet even the veggie haters will love this, Sue.